CAIRO, Egypt -- It gives new meaning to the phrase "a wolf in sheep's clothing." Or in this case, a donkey in zebra stripes. A zoo in Cairo, Egypt, has been accused of trying to fool visitors by painting zebra stripes onto a donkey, but the zoo director insists the animal is the real thing. Mahmoud Sarhan, 18, said he was visiting a recently-opened animal sanctuary at the International Garden municipal park when he spotted a strange looking animal. Sarhan said several things about the animal stood out and made him suspicious. The black paint had melted on the donkey's face and the ears didn't look like the right size for a zebra, he said. He posted a picture on his Facebook page, which quickly went viral. In the photo, he's posing next to the animal, looking bemused. He wrote in Arabic: "The stupidity has reached in the country that they brought a local donkey and painted it to look like a zebra." 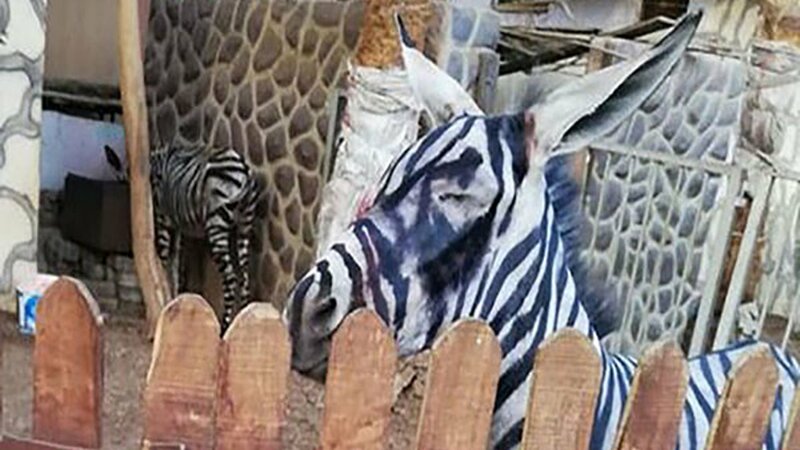 The director of Gardens Project in Cairo has denied the reports that they had tried to pass off the donkey as a zebra. "The zebra is real and not painted," Mohammed Sultan told Egypt's Youm 7 news channel. Sultan added that the animals are well taken care of and are inspected regularly to ensure their welfare. After reviewing the images, a leader with the animal activist group PETA disagreed that this animal was well taken care of. "No reputable animal care facility would subject a skittish animal like a donkey to the stress of being restrained and sprayed with chemicals like paint, which could cause a painful allergic reaction, and PETA hopes that Cairo authorities are fully investigating this matter," PETA Foundation Vice President Delcianna Winders told CNN in a statement. This isn't the first time a zoo has tried to pull the wool over visitor's eyes. In 2013, a zoo in China angered guests by trying to pass off a hairy dog as a lion. And the "lion" even barked.